Trump to end DACA, NBC reports. Immigration activists outside of Trump Tower in New York City on Aug. 15. 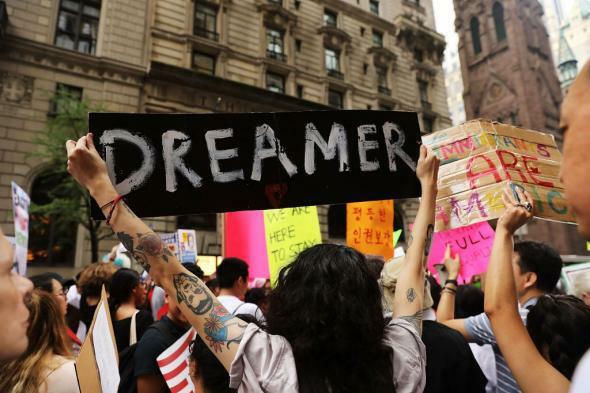 President Donald Trump appears likely to pull the plug on DACA, the Obama-era program allowing young people who came to the U.S. illegally as children to remain here, several government officials said Friday. Administration officials said the Department of Homeland Security sent a recommendation to the White House earlier this week on what to do, and Attorney General Jeff Sessions discussed the program with senior officials Thursday at the White House. Sessions has been a consistent opponent of the program, formally known as Deferred Action for Childhood Arrivals. The move would seem to be a reversal of Trump’s previous suggestion that he would “deal with DACA with heart” and that its beneficiaries “shouldn’t be very worried.” A recent Morning Consult poll found that even Republicans largely oppose the deportation of DACA-eligible individuals. The perceived existential threat of immigration is, however, a consistent concern of the white supremacists who have supported and served in the Trump administration. In 2015, Jeff Sessions praised the 1924 Johnson-Reed Act—which imposed strict limits on the entry of groups like Italians, Asians, and Jews who were perceived to be racially inferior—during a radio interview with Steve Bannon. “It was good for America,” said Sessions.